Ernie Kovacs was a visually experimental physical comic who achieved great popularity before his early death in 1962. He was a talented writer, director, and performer, but he was also lucky, appearing at a time when television was dominated by aging vaudeville stars and radio comics, leaving a space for his surreal improvisation and technical innovation. He would have been too leftfield for the conservative rating-chasers who took over the networks in the late 1960s. His library scene is a typical routine. A gentleman's club provides a setting for a series of visual and sound gags by his character Eugene, a bumbling accidental existentialist. Kovacs finishes with his most famous stunt - a gravity-defying lunch, in which a cornucopia of fruit and a flask of milk defeat the laws of physics and fly sideways off a (library) table. Kovacs plays the act silently (Buster Keaton was his most significant influence), though his clothes, shoes, lunchbox and miniature record-player all continually rattle, hum, squelch and groan. 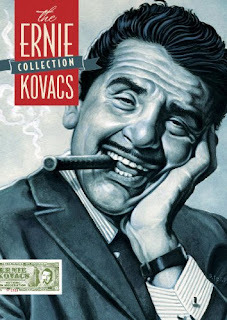 The library provides an added layer of incongruity, while also allowing high and low cultures to intermingle to comedic effect - unsurprisingly, Kovacs would later be acknowledged as an inspiration by the comedians of Monty Python.